Highly accurate analytical scale with verification offers all the functions that you might need in the laboratories. Its draft shield protects the scales from the external influences like for example the air breath. Logical menu-based controls and a large backlit display LCD allow precise reading of the results. You can choose the reference of sample quantity. With the integrated RS-232 interface and the optional software kit you will be able to transmit the weighing data to a computer or portable. The analytical scale with verification can be used for doing mixtures in drugstores and for analysis in medical laboratories and pharmacies. 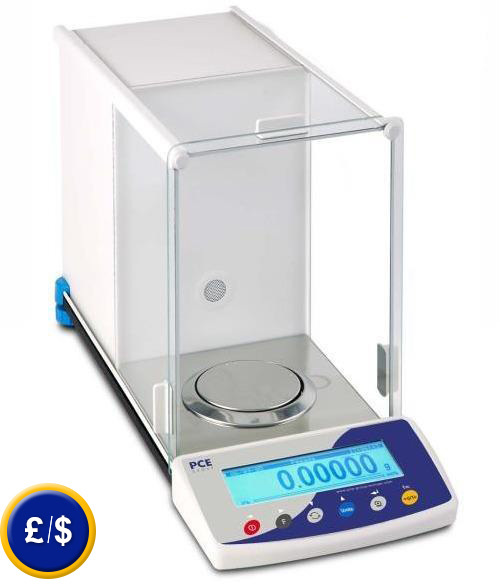 The analytical balance PCE VXI 60/220 can be verified according to M I class and can be calibrated according to ISO. We can do it for you. a company specializing in calibrations. The kit includes a software for transferring the weighing data to a PC or Portable and RS-232-cable. The transferred data can also be sent to other software as Excel, etc. The standard software is in English language (other languages are also available: French, German, etc). The printer is used for direct output of weighing data. It will be delivered with RS-232-cable, USB-cable, net adapter and 1 roll of paper.